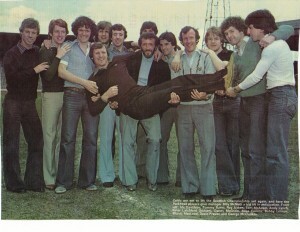 This picture is taken from 1979 and shows the new youthful League Champions enjoying a bit of fun in their civvies with manager Billy McNeill. Vic Davidson can be seen sporting the biggest pair of Dan Dare’s (flares) known to man and a collar so large it would be a danger to his eyesight on a windy day. Danny McGrain makes the cardinal sin of wearing a brown dress jacket, sky blue polo neck and a pair of silver shoes. Poor Danny obviously suffered a power cut that day and had to dress in the dark. Bobby Lennox looks resplendent in his Lyle and Scott jumper and his grey slacks and is obviously desperate to get away and model his new look on an Ayrshire golf course. Big Roy Aitken goes for the casual look of cheesecloth shirt, flared denims and trainers, although his ‘sannies’ look at if they’ve seen better days. Tommy Burns sports that classic 70’s mix of brown and beige which was so popular in that decade and has a pair of brown ‘pointers’ (shoes to the uninitiated) that John Travolta would have been proud to wear during the filming of Saturday Night Fever. 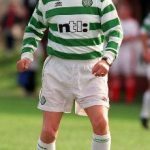 The young Murdo MacLeod sports what appears to be a ‘Simon shirt’ a fore runner to the polo shirt of the modern day. A close look at Murdo’s footwear shows what is possibly Cuban heeled boots with steel toe caps, a very strange mix indeed. 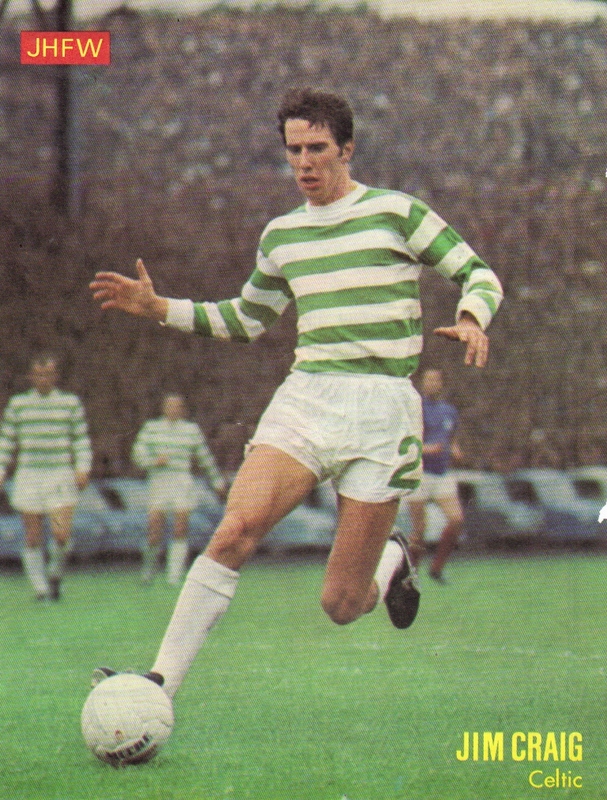 Davie Provan’s green jumper has a V neck which almost reaches his naval but it’s Davie’s trendy curly locks that require most attention. So naïve was I in the 70’s that I believed that Davie’s hair was naturally curly but a quick look at him on Sky Sports these days tells you that the perm was indeed a wonderful creation and was very much in vogue at this time. You can just imagine the wee man in a unisex hairdressing salon with his curlers in under the dryer. Billy McNeill smiles safe in the knowledge of a man who knows that McGrain and Lennox are lifting him and that Peter Latchford is out off the way at the back and therefore not likely to drop him. 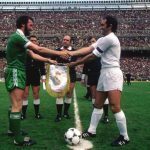 This article is brought to you in conjunction with Claude Alexander, Ger-ralds, Tom Martin and John Collier (the window to watch). 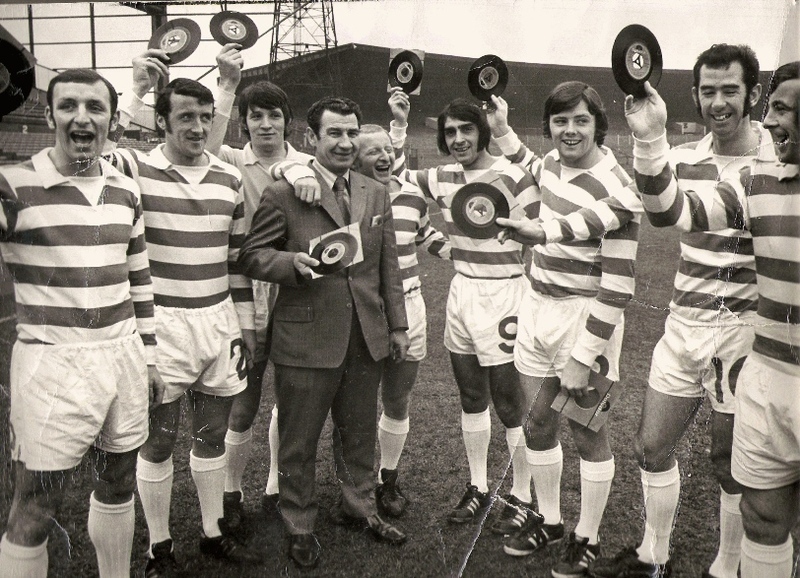 This picture is from February 1973 and shows a group of Celtic players with copies of the new single ‘Celtic your favourites in green’. 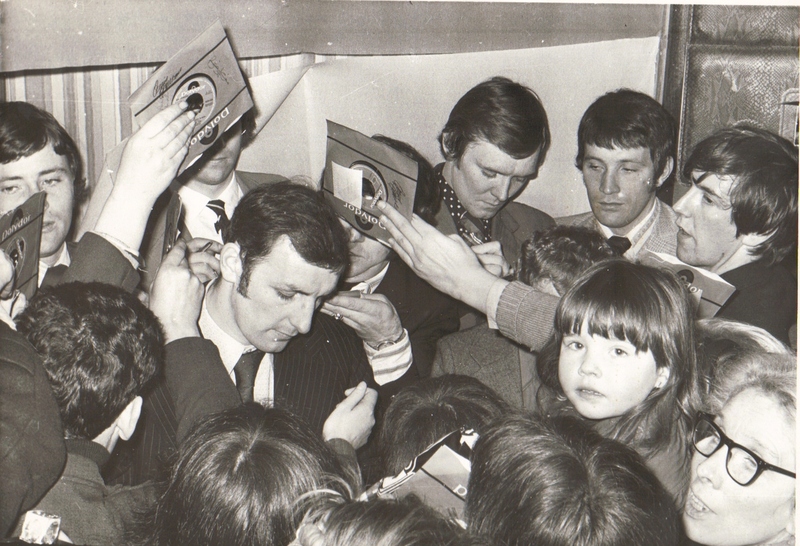 From left to right we have Pat McCluskey, possibly Ally Hunter, Jim Brogan, Dixie Deans, Davie Hay and Evan Williams signing autographs for their adoring fans. I don’t know where this photo was taken but a close inspection of it shows the wallpaper on the wall peeling off. 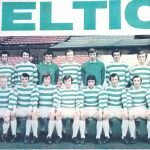 For Celtic your favourites in green. 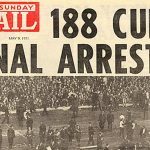 The song was popular for a while but two months later the lyrics were out of date as the ‘number’ did indeed grow when Celtic won their eight in a row league title at Easter Road. Happy days.